Sharpton held a press conference with Meek Mill’s attorney Joe Tacopina on Monday. Following his visit with Meek Mill at a Philadelphia prison on Monday, Al Sharpton spoke to the press. With the rapper's attorney Joe Tacopina behind him, Sharpton spoke about the harsh sentence and said that Meek Mill's case should be viewed as an example of the broken criminal justice system in this country. "I came because I feel that Meek represents thousands of people in Pennsylvania, and even tens of thousands around the country, that have been victimized by abusive probationary and parole systems," Sharpton said. "If you can do this to a successful artist like Meek Mill, you can do this to many around the country. He is representative of something far more than his stardom — he's a symbol of the abuse of this system." Meek Mill was sentenced to two to four years in prison for probation violations on November 6. 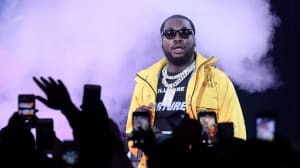 The rapper and his legal team have filed an appeal, as well as a motion to remove Judge Genece Brinkley from the case. Watch two videos of Al Sharpton speaking to the press after his visit with Meek Mill above and below. Thumbnail image: Paras Griffin / Getty Images and Meek Mill's Instagram.